Introduced in 2009, the Hyundai Genesis is still a relatively new player in its segment. The premium-trimmed sedan was designed to compete directly with other upscale four-door sedans like the BMW 5-Series, and Chrysler 500. The mid-size sedan comes packed with an incredible list of luxury standard features, making it a high-quality contender in the automotive world. The Genesis enjoyed a receptive introduction to the market, undergoing many renovations since 2009 to keep up with the luxury sedan segment. The 2015 Hyundai Genesis represents the first year in the vehicle’s second-generation, and has received a major renovation to mark the occasion. 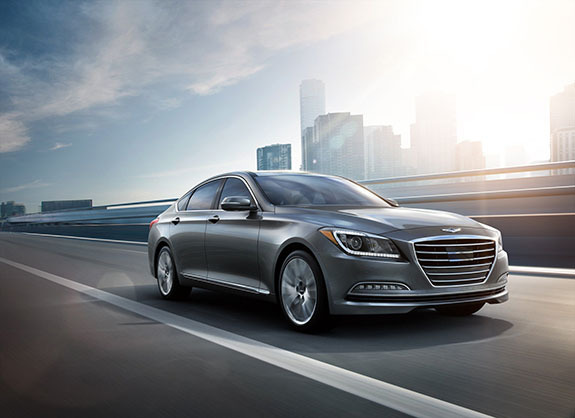 The all-new 2015 Genesis features a long list of the most innovative active safety features the sedan has ever had, and has a complete new exterior and interior look to mark the second generation of the mid-size sedan. The designers and engineers did not solely focus on aesthetics for the 2015 Genesis, but also revamped what is under the hood as well. The 2015 Hyundai Genesis is a safer, more stylish, more powerful sedan than ever before, and the world is taking notice. Safety is one of the most important aspects to consider when purchasing a vehicle. Whether driving to the office every day in traffic, or transporting your family to an outing, having a car that can protect you and your most precious cargo is not only important - it’s imperative. Hyundai recognizes this, and has added a slew of active safety features to ensure total protection in nearly any situation. The all-new Genesis is so safe, that it has been recognized by the Insurance Institute of Highway Safety as one of the safest vehicles on the road, earning it Top Safety Pick+ recognition. It was also awarded a 5-Star Safety Rating by the government’s National Highway Traffic Safety Administration, furthering its safety reputation in the automotive community. The 2015 Hyundai Genesis comes equipped with nine standard airbags, for a surrounding cushion of safety throughout the cabin. Check out other features that are helping to make the 2015 Genesis one of the safest vehicles on the road today. Automatic Emergency Braking System - Using cameras and radar sensors, this innovative technology can see what’s happening ahead of the vehicle, and alert the driver of any danger - even in the most extreme conditions. In the event of an imminent crash, the system deploys automatic emergency braking when the driver does not react. Lane Departure Warning with Lane Keep Assist - This technology can detect automatically when a driver has trouble staying in their lane, and uses gentle steering compensation above 44 mph to correct it. Through steering wheel vibration, and visual or audio warnings, the driver will be alerted of vehicle drifts outside of their intended lane without signaling. Blind Spot Detection with Rear Cross-Traffic Alert - A radar system on the Genesis detects and alerts drivers when a vehicle is in its blind spot, or in the rear cross path while backing up. Smart Cruise Control - Automatically-adjusting cruise control changes speed based on the car traveling in front of it. It can even come to a full and complete stop and accelerate again, without any driver interference. HID Headlights with High Beam Assist - These advanced headlights can automatically switch from high beams to low beams when an oncoming car is detected. Heads-Up Display and LCD Color Instrument Panel Display - Drivers will always be “in-the-know” with this interactive 7-inch color instrument panel display that includes: speed, navigation, lane departure warning, and blind spot detection, all in the driver’s line of sight. When engineers were tasked with redesigning the Hyundai Genesis for the 2015 model year, they more than delivered. Featuring a new simple and harmonious exterior design, engineers incorporated Hyundai’s Fluidic Sculpture 2.0 design philosophy, giving it a more distinguished and modern look. The hexagonal front grille gives the Genesis a striking front appearance, while the longer wheelbase and stronger overhangs work to deliver a slightly roomier cabin, and a more performance-driven rear-drive system. 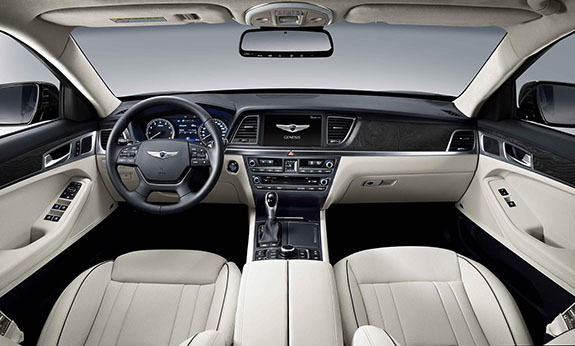 The interior of the 2015 Genesis is also new, with a completely updated cabin layout and appointments. The more spacious, comfortable interior features a user-centric design, complete with a new center stack with console, upper-instrument panel, and new ergonomic seating. Safety, intuitiveness, and simplicity were the guiding interior design principles for the all-new Genesis. The use of high-grade materials throughout the cabin include genuine aluminum and matte-finish wood, and deliver a decrease in interior reflections, as well as brightened dashboard surfaces. Everything about the new exterior and interior design of the 2015 Hyundai Genesis is enhanced for comfort, usability, and luxury. Since it was first brought to market in 2009, the Hyundai Genesis has been a great contender in the luxury sedan segment. Offering a sleek and luxurious design, the most advanced safety features, and high-quality materials, it is no surprise that the midsize sedan has been pulling ahead of its competition. Thanks to the all-new redesigned Hyundai Genesis for 2015, this is more true than ever before. Not only does the Genesis offer great exterior styling cues, and an innovative cabin, it now offers drivers the most powerful Hyundai V8 engine under its hood. The 5.0-liter award-winning Tau V8 engine produces an impressive 420 horsepower and 383 lb.-ft. of torque. The Tau V8 engine has been named one of Ward’s Ten Best Engines three times, and features high-pressure direct injection for high power, low emissions, and excellent efficiency. Paired with an eight-speed automatic transmission with SHIFTRONIC manual shift capability and steering wheel paddle shifters. The Tau engine features Dual Continuously Variable Valve Timing, low-friction coatings on piston skirts, and a tuned variable induction system. The new engine offering on the 2015 Genesis is impressive on its own, but even more so when compared to other vehicles in its class. Check out how the competition stacks up to the most powerful V8 engine the Hyundai Genesis has ever had. Infiniti M56 - A 5.6-liter engine is offered, and matches the Genesis with 420 horsepower. Audi A6 3.0T - This high-performance luxury sedan offers drivers a 3.0-liter V6 SC engine, and tops out at 310 horsepower.